The ​Panhellenic Philanthropic Projects committee annually coordinates philanthropic opportunities for sorority women to volunteer in the community with its primary goal being to raise funds for undergraduate and graduate scholarships as well as personal development programming for Panhellenic women in Arizona. 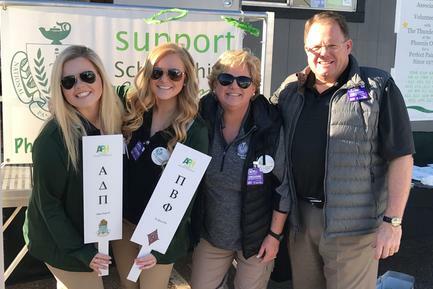 Panhellenic volunteers annually donate their time to work concessions at the Waste Management Phoenix Open volunteering in the concession booths. ​Since 1975, Thunderbird Charities has generously donated over $850,000 to Phoenix Panhellenic Association for its volunteer support at the golf tournament. Friends of Phoenix Panhellenic Association are encouraged to purchase TICKETS fore CHARITY for the Charles Schwab Cup Championship. 100% of proceeds from general admission ticket purchases are returned to the Phoenix Panhellenic Association for our Scholarship Program. Make sure to choose Phoenix Panhellenic as your charity when you purchase tickets! ​Each fall Phoenix Panhellenic Association collects Teddy Bears & stuffed animals for various Phoenix area emergency responders to comfort children in crisis situations. Over 1,500 stuffed animals are collected annually by our Panhellenic membership in conjunction with fraternity & sorority chapters at Arizona State University. Gilbert Fire Department, Glendale Fire Department, Mesa Fire Department, Phoenix Fire Department, Salt River Fire Department, Tempe Fire Department, Rural/Metro, AZ Highway Patrol, A Mighty Change of Heart.